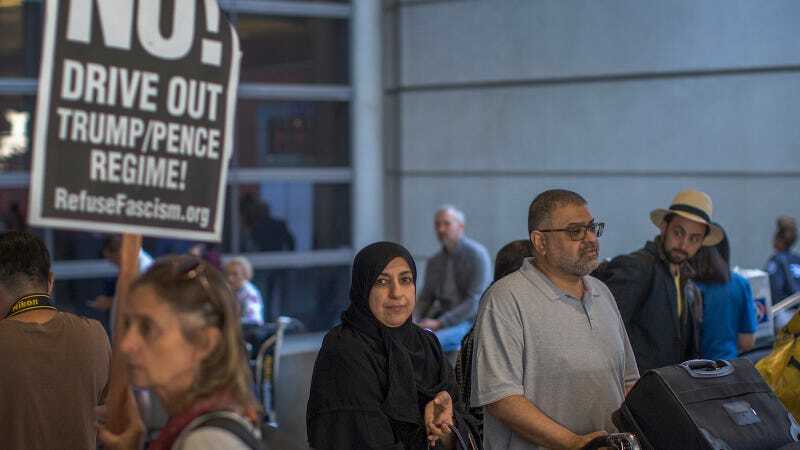 Arriving international travelers pass protesters on the first day of the the partial reinstatement of the Trump travel ban, temporarily barring travelers from six Muslim-majority nations from entering the U.S., at Los Angeles International Airport (LAX) on June 29, 2017 in Los Angeles, California. The Trump administration is once again targeting the United States Refugee Resettlement program. After slashing the number of refugees allowed into the country to just 45,000 last year, the lowest that any administration has attempted since 1980, the White House is reportedly planning to reduce the limit again by as much as 20,000, the New York Times reports. By comparison, in 2016, President Obama called to admit 110,000 refugees. If Chief of Staff John Kelly had his way, the U.S. would admit none, or possibly only one, refugee per year. If it were up to Trump advisor and white supremacist Stephen Miller, the architect of the Muslim ban and family separation policy, up to 15,000 of the world’s most vulnerable would be allowed in. But the official implicitly made the case for substantially reducing refugee admissions. A “migration crisis” was gripping the country, the official said, and the administration was instead prioritizing asylum cases in which a person is already in the United States and claims a credible fear of returning home. Refugees, by contrast, are generally people outside the country who have met that bar and are seeking resettlement in the United States. “In determining an appropriate refugee ceiling for 2019, the administration will consider the entire humanitarian caseload, legal and illegal — including asylum-seeking refugees, non-asylum seeking refugees and other categories such as special immigrant juveniles, unaccompanied alien minors, temporary protected status and other related programs,” the official said in a statement, provided on the condition of anonymity because the deliberations were continuing. “Prioritizing asylum cases,” is a strange way to phrase what the administration is actually doing, which is blocking asylum cases, a strategy they are again applying to refugees. This administration can walk and chew gum at the same time.